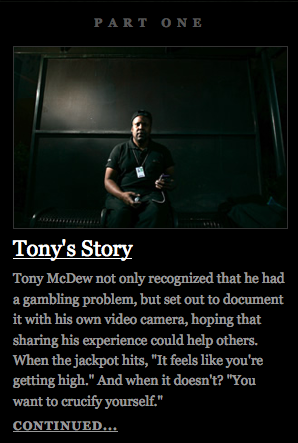 In 2009, the Las Vegas Sun ran a series on gambling addiction. The series contained a number of multimedia pieces, including this video diary shot by the subject, Tony McDew, and edited by Sun editors. McDew documented his addiction with his own video camera, hoping that sharing his experience could help others. This entry was posted on Thursday, January 19th, 2012 at 1:33 pm and is filed under MULTIMEDIA EXAMPLES, VIDEO. You can follow any responses to this entry through the RSS 2.0 feed. You can leave a response, or trackback from your own site.